The property has been renovated by the present owners and benefits from versatile accommodation and a large family kitchen/dining room, it is double glazed and has dual central heating systems. Additional 125m² over kitchen with windows and heating etc. in place to include into accommodation. There is a garage and workshop in the basement and other outbuildings. An old bread oven has been converted on the ground floor into the gîte but the first floor needs finishing. Viewing is highly recommended. 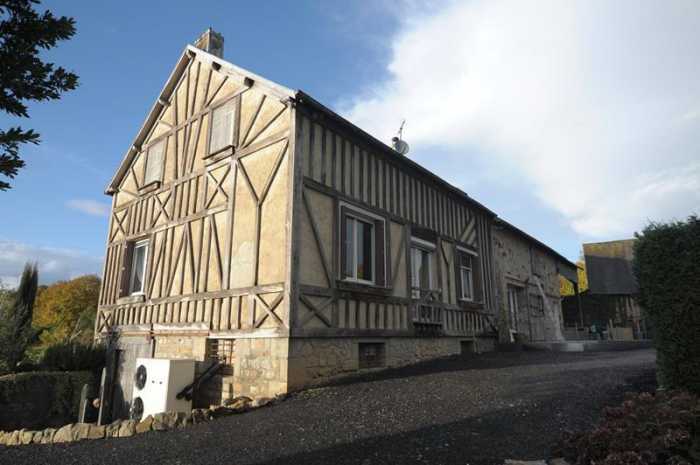 It is situated near Mortain where you will find shops, schools, doctors' surgeries, supermarkets, etc. and local walking, and fishing. Extensive recreational facilities can be found nearby including local waterfalls and walking clubs, canoeing and outdoor sports. Major towns such as Caen, St Malo, St Lo, Falaise, Bayeux, Honfleur and Northern Brittany available for day trips. Normandy landing beaches are easily accessible. Suisse Normande and Spa towns 35 minutes drive. Choices of Golf Clubs with open availability for non members. Large French Mobile home site within 50 minutes for all resort facilities… pedaloes, canoe, football, fishing, pools with slides, snooker , entertainment. Sports centre with pool and slides, Go Karting and board park less than 15 minutes. Local village with many bars restaurants and shops. Weekly market on a Tuesday in Sourdeval, including Livestock. 20 mins to Bowling, sports centers and 18 hole golf course and the forest of Saint Sever. Beaches within an hour, river activities/ forests/ spa resort within 45 minutes. The nearest Airport is at Dinard (70 miles), Ferry Port at Caen (50 miles) and the nearest train station is at Vire (15 miles) from where you can take a fast train to Paris. “L” shaped Kitchen/Dining Room 6.86 x 4.77m and 3.91 x 3.20m Partly glazed door and window and glazed double doors with glazed side panels to east elevation. Tiled floor with underfloor heating. Inset spotlights. Large breakfast bar (seats 10 people). Range of kitchen units including ful height units to one wall. Space for American style fridge/freezer. Built-in electric oven. Glazed double doors to rear elevation. Stainless steel sink with mixer tap. Space and plumbing for dishwasher. Island unit with 2 electric induction hobs with extractor over. Central heating thermostat. Large built-in cupboard. Utility Room 3.60 x 2.16m Space and plumbing for washing machine. Tiled floor. Cloakroom Tiled floor. WC. Vanity unit. Inset spotlights. Underfloor heating. Living Room 7.55 x 5.70m Fireplace with wood-burner (flued). Window to rear and window and glazed double doors to front elevations. Radiator. Central heating thermostat. Exposed beams. Stairs to first floor. Shower Room 2.68 x 1.74m Window to rear elevation. Radiator. Built-in cupboard. Shower. Vanity basin. Tiled walls. Extractor fan. Bedroom 1 3.65 x 2.85m Window to south elevation. Radiator. Built-in wardrobes to one wall. Bedroom 2/Study 3.63 x 2.33m Recess with hanging rail. Window to front elevation. Door to stairs to garage. Bedroom 3 3.74 x 3.27m Wardrobe and desk. Laminate flooring. Sloping ceiling. Radiator. Cloakroom WC. Radiator. Storage cupboard. Vanity basin. Bedroom 4 3.51 x 2.80m Sloping ceiling. Radiator. Inset spotlights. Wardrobe and desk. Laminate flooring. Master Bedroom 6.41 x 3.53m 2 windows to south elevation. Wood flooring. Built-in wardrobe. Jacuzzi bath. Vanity unit. Exposed beams. Double wrought iron gates give access to tarmac drive. Mature trees. Detached Stone Bakery with tiled roof which is partially renovated as a gîte. Small kitchen area. Shower room with WC on ground floor. First floor to renovate. Separate base and foundation for workshop (materials on site). Polytunnel. Timber wood shed. Garden laid to lawn. Mains water and electricity. Drainage is to an all water septic tank installed in 2005. Oil fired central heating together with a heat exchange system. Please note : Whilst the Energy Report has been carried out there is no Energy Rating for this property because the owners do not have the last 3 years' bills for full time occupation.